While recently discussing emotionally devastating movies to watch (I know, right? 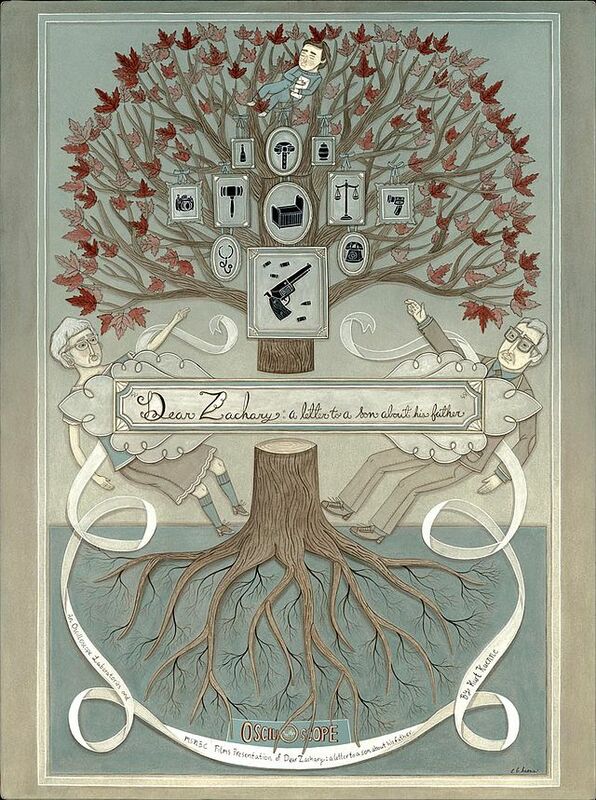 ), a number of titles got tossed around, but I finally settled on a documentary feature on Netflix entitled Dear Zachary: A Letter to a Son About His Father. It turned out to be one of the most emotionally taxing films I have ever seen. I was told to watch the movie without looking at any synopsis for the film, and I didn’t. I went into it blind and would strongly encourage anyone else that wants to watch it to do so as well. That being said, stop reading this right now and go watch it. Once your eyes have dried come back here and we can discuss it further. If you prefer, you can just keep reading, as I anticipate some of you will do. I won’t give away much in the rest of my review, so if you decide to keep reading I won’t blame you. The movie is about Dr. Andrew Bagby. Bagby was a man that was loved by just about everyone that he that had the pleasure to know him, he was kind, witty and smart. The film seeks to memorialize him by talking with everyone that he knew. The filmmaker, Kurt Kuenne, was one of Bagby’s best friends growing up. That’s why, when the news of Andrew’s untimely murder reaches him, he sets out to preserve his friend’s memory. Yes, Andrew Bagby was murdered. While the initial intent of the film was to record numerous people talking about who Bagby was to them, it turns into a fascinating and absolutely heart wrenching look into the faults that face the legal system. As the film progresses, details about the incident that left Bagby dead. Slowly Andre’s parents become the focal point as Andrew’s former girlfriend and accused murderer comes forward with the news that she is carrying Andrew’s child. Andrew’s parents then proceed a long legal battle for custody of their grandson. The pure emotional energy is overwhelming. Those interviewed for the film express a great deal of joy in reminiscing about Andrew Bagby, and then instantly crumble into to tears. The movie is a case study on injustice, and pain and hatred and anger and loss and devastation, so much so that the weight of it is shared with the viewer. I normally am turned off from films with a political agenda, whether I agree with it or not. 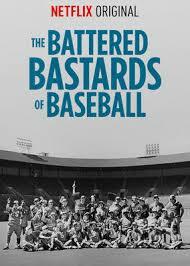 But I have to recommend this movie based solely for it’s genuine emotional value. Very few movies have had the effect that Dear Zachary had on me. It highlights both the evil in the world as well as the hope. When people grieve they find the darkest parts of themselves seeping out, and this film is all about grief in the most horrendous of circumstances. It is, however about hope and determination. It’s not an easy movie to watch, but one I would recommend. The emergence of Kickstarter has managed to bring about a number of awesome things that would otherwise not had the funding to exist. Today I want to point some attention to a project that started in that haven for unique ideas by drawing attention to a documentary film that I cannot wait to see. Dear Mr. Watterson explores one of the single best comic strips to ever grace the pages of a newspaper; Calvin and Hobbes. The film interviews a number of people that have been influenced by the strip in an attempt to define what makes the comic so endearing to anyone that reads it. 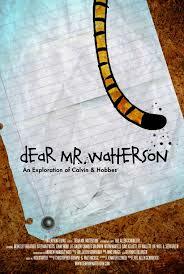 The movie is not about finding out what Bill Watterson has to say about his creation, rather it appears to be a simple thank you note. Watterson’s long running strip ended over a decade ago, and since then he has kept an extremely low profile, something that the filmmakers respect. Calvin and Hobbes continues to be one of my favorite pieces of reading material. My coffee table is littered with multiple collections showcasing some of the best that that particular art form has to offer. I am seriously pretty excited about this movie. Check out the website here for more information and watch the trailer below! Cult films are recognized as such for their fiercely devoted, but often times small, fanbase. While the majority of the population may be blissfully ignorant of a particular piece of film history, there is a small portion that recognizes the merits or find themselves amused at the folly of a particular movie so much that they elevate it to the status, in their collective minds, of a classic film. I watched a documentary this weekend that centered around the lives of the actors, and the filming of a cult film that I reviewed a little while back; Troll 2. Best Worst Movie not only does a fantastic job of explaining to you why Troll 2 is well worth your time to watch, but it presents a fascinating narrative following the lives of people that, 20 years after the fact, realize that they’ve developed relative stardom. Michael Stephenson directs this film in an attempt to bring to bring light to the fact that a phenomenon has been nurtured to the point that those involved in movie, do indeed have fans that loved their work, albeit for the wrong reasons. Stephenson played the young boy, Joshua, in Troll 2; in this movie he remains largely behind the camera. The real focus and voice piece of the documentary is George Hardy, a well known and loved dentist in Alabama. It is made clear within the first minutes of the movie that Hardy is loved by just about everyone he encounters, even his ex-wife has nothing bad to say about him. Hardy is absolutely blown away by the reception, that his little movie that he was so embarrassed about most of his life, receives at screenings for devout followers of the film. We follow most of the cast as they interact with their fan base and we watch George Hardy’s ego swell during the course of the film. It’s fun to see people who have forgotten (or have tried to forget) their acting “careers”suddenly get the stardom that they had hoped for. While it’s a blast to watch fans and actors react to one another, the humanity in the story reveals itself when the obscurity of the movie subjects George Hardy to particularly uncomfortable situations, including him sitting at a “Horror Convention” booth for almost the entire day with almost no visits. Michael Stephens attempts to reconnect the entire cast and crew for the premier that Troll 2 never had. In this quest we get a fascinating glimpse into the lives of people who took a crack at their dreams of making movies and had it not quite pan out. Some managed to have relatively successful careers, some found other paths to success and others continue to strive towards that goal. For all the hilarious nonsense that Troll 2 turned out to be, it garnished a surprisingly touching story for those involved. 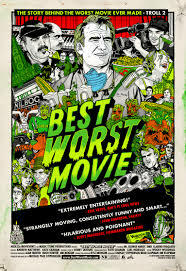 Best Worst Movie manages to accurately explain the phenomenon that is cult films, as well as present a surprisingly relatable documentary. It is, unsurprisingly, very easy to be bad at something. Really, anyone can be bad at anything, if they put their mind to it; however it’s something else entirely to be the worst. To be universally recognized as the worst of anything takes something truly special. 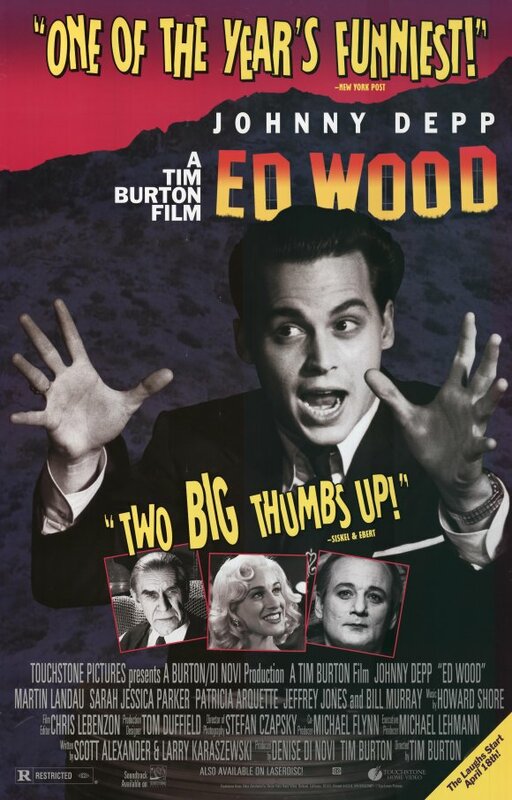 In Ed Wood Johnny Depp portrays the titular director/writer/actor and his unique experience in dealing with Hollywood and all it’s various forms of monsters. Wood’s cinematic atrocities stemmed from a passion for the craft that he strives to be recognized in. And recognized he certainly was, only it was in ways that he never intended. Ed Wood chronicles the career of Edward D Wood Jr. His meager beginnings as a stage director morphs into a screen debut when he befriends aging horror actor Bela Lugosi and they begin to make pictures together. With a smidgen of star power on his side, Wood continues to take his motley crew through a series of backyard special effects fueled adventures as he discovers and refines his all engrossing passion. The lengths and determination behind Wood are incredible. Single takes, no filming permits and replacing deceased actors mid feature are just a few of the faux pas that he commits. All Edward Wood wanted to do was to make movies, and make them he did, his rapid fire pace when shooting scenes jumps to the screen through Johnny Depp’s charisma. Wood’s motley crew of Hollywood misfits and has-beens become increasingly entertaining through the duration of the film. Cardboard effects bizarre story lines and angora sweaters power the madness of Ed Wood. Tim Burton directed this film, and while his signature visual style is ever present, it doesn’t make it any less attractive to look at. Few people choose to film entirely in black and white, but it was a decision that certainly worked in favor of the film as a whole. Burton, like wood, sees his movie as a big picture, he maintains complete control of the feature and all it’s overarching components. Unlike wood, he is careful to pay attention to the small details as well. Choosing the perfect cast, he matches them with great costumes and set designs that are just as terrible as an Ed Wood biographical film should be. Martin Landau plays Bela Lugosi, he matches the facial expressions and dialogue of the legendary actor excellently, while at the same time delivering a performance that is entirely his own. This is the “follow your heart” message that Disney has been pumping out for years, however where Disney assures you you’ll be good at whatever you aspire to, Ed Wood lets you know that you may just be terrible at it. Burton seems to use this not as a discouraging tactic, but rather as a way to speak the message of the film, which is to do what makes you happy, and pursue it with all you’ve got. Whether that’s a message you can get behind or not, it doesn’t detract from the entertainment or visual value of the film. 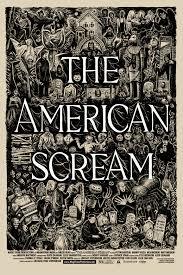 Burton presents us with a movie that is far different from the majority of his filmography, it is far slower, taking it’s time to allow the themes, characters and emotions to stew and sink in. This is an oft overlooked piece that deserves far more recognition than most of Burton’s recent works. However, his demographic tends to be teens with a slightly darker side, and this may not appeal to them. Burton chose to make a film he wanted to make, and thanks to that we have Ed Wood.